← Poem – the room for actual dying. Home » Encouragement » Invisible walls. Have you ever come across a wall that you didn’t even know was a wall? There is a wall at the library. We have an open part of the counter. The counter is very long, and one of the ways behind it is to the left. People see it as a wall. If their children run behind the counter, they stand, helplessly, calling to their children. Come back, they say. The children ignore them. They will never cross that line to come behind the counter to get their children unless we tell them to. It is programmed into them. Now it is more interesting. 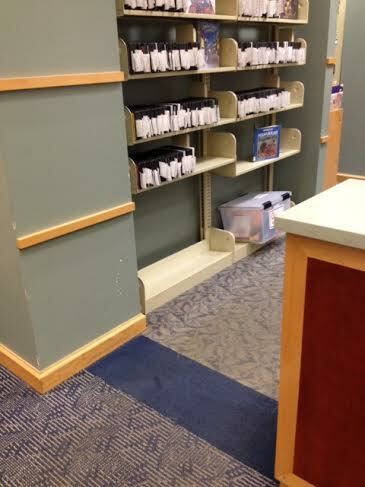 Now we have the DVDs that are on hold behind the counter. They started getting taken by people who didn’t have them on hold, so we had to move them here. The shelf for these holds is right next to the end of the counter. We’ve told the regulars to just go ahead and get their DVDs if we are busy. They still see the wall. They still don’t want to. Sometimes they will stop, just at the color change on the carpet, and lean in as far as they can to get their movies. And it got me to thinking. What other walls are there? What else is there in my head that I’ve been programmed into thinking is something that can’t be done, some rule that I’m breaking? The view from the patron’s side. The view from our side. Notice that the carpet is different on our side versus their side. 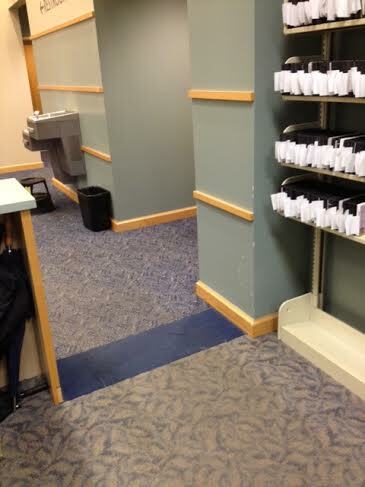 That dark blue line is used throughout the building, wherever there is a post or a counter. 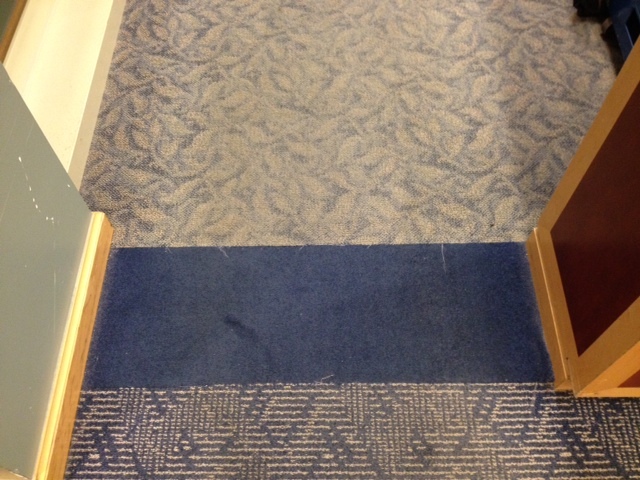 It probably makes it easier to blend carpets when they come together around a difficult corner. I don’t know if the blue part is the bit that stops people, or that it is the end of the counter. What “walls” do you have? What prevents you from doing something? What has been programmed into you, that you needed to know then but don’t need to know now? What have you generalized as a “rule” that really is a “suggestion”? This entry was posted in Encouragement, Library and tagged invisible walls, limitations, walls. Bookmark the permalink.